This is one of the most advanced 1-way security systems in the world from Clifford that will wrap your vehicle in protection, with the most sophisticated electronic technologies available today, including the dual-zone vibration/impact sensor and 6-tone Insignia2 siren. This state-of-the-art system also offers in-demand convenience feature like keyless entry. *Range based on line-of-sight, unobstructed testing in ideal conditions. Actual range will vary due to local conditions including, but not limited to, environment, terrain, physical obstructions, vehicle location and orientation, interference and other possible impediments. **Additional parts and labor may be required. G5 has arrived, the first major vehicle security advancement of the 21st century. Over the past quarter century, Clifford engineers have created five distinct generations of definitive vehicle security technologies. G5 systems are the most advanced, reliable and uncompromising Clifford systems ever built, backward compatible with G4. Directed Electronics recently made a significant performance upgrade to the RF receiver section of many of our award-winning security and remote start systems. The new XR+ Extreme Range superheterodyne receiver has an improved sensitivity specification of between 3 dB and 6 DB, which equates to a measurable range increase on the order of 15 percent. It also offers improved image rejection for certain types of RF interference, resulting in improved reliability. Need help choosing a Clifford G5 Systems? Let us help configure a solution that fits you and your car. Clifford® systems come with a variety of options and features. 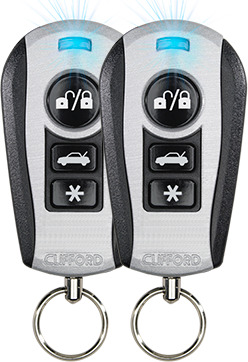 Looking for a replacement remote for your Clifford® product? You can go straight to our online store. Contact us if you need help with a Clifford® product you own, or if you have a question about ordering online.